Patagonia Ecomultisports is operated by Marco Gutierrez. Marco and his team have a comprehensive network of providers on San Cristobal that can accommodate all your fishing, touring, lodging, and dining needs. Your guide for the fishing adventure is none other than Boston legend, Pete Santini. Pete is the most experienced and entertaining fishing guide that you will find in San Cristobal. You are guaranteed to have a great time and catch plenty of fish! Most fishing is done on the custom built Vertigo II which is rigged specifically for marlin, tuna, and wahoo fishing. Snacks, lunch and beverages (soda, water, juice and beer) are provided on the boat. You can take whichever fish you catch that day to a restaurant for dinner that evening. There is nothing better than fresh Tuna sashimi and grilled Wahoo for dinner! 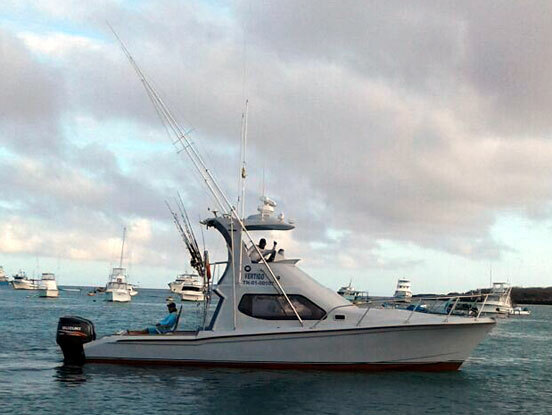 Marco and his team can also provide additional boats to handle several groups of anglers at the same time. Advanced notice is appreciated.